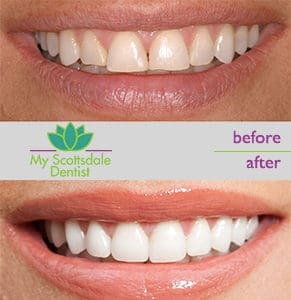 It’s Time to Get Your Smile Back in Shape with our Teeth Whitening Treatment! ONLY $99.00!! Call Us today to Schedule your In-Office Whitening Session for only $99! Retail price is usually over $300! Hurry this offer won’t last long! The LED light allows the proprietary gel to whiten faster with reduced exposure to peroxide. Individual ampoules of Vitamin E are used to moisturize and protect the lips and skin during the treatment. The design of the silicone trays allows the jaw muscles to remain relaxed and tension free during the entire treatment. 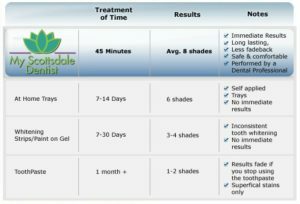 Smile Perfected consults with the smartest, most innovative, and most credentialed professionals in the industry. 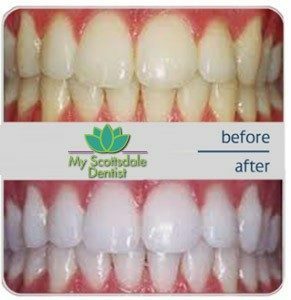 This collaboration has allowed Smile Perfected and My Scottsdale Dentist the most effective, safe, and comfortable professional whitening systems available. Learn More about Teeth Whitening! Having clean, dazzling white teeth is essential to a beautiful smile, a beautiful smile is essential to an eye-catching appearance, and we all know that an eye-catching appearance can help open many doors both professionally and personally. This Teeth Whitening System can be applied either in the office or in the convenience of your own home. Your teeth can be significantly whiter in about one-and-a-half hours for the in-office teeth whitening treatment.